I recently had an opportunity to write an article for AOTA’s Technology Special Interest Section Quarterly “What’s in Your Occupational Therapy Mobile Tool Kit?” published this June 2013. Limitations of the length of the article did not allow inclusion of names of apps. 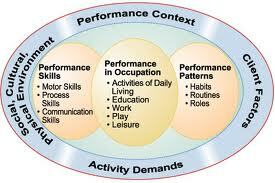 The following is a brief list of apps by areas of occupational performance. More apps can be found on the menu link to the OT’s with Apps mTool Kit List, and of course there are many more that could be listed! Note: App prices are subject to change. Many thanks to Jan and Gavin for their patience and assistance with the article! It is amazing what time and support they give to generate articles. Do you have favorite apps in any of the occupational performance areas that you have used with clients? Please share! This entry was posted in Activities of Daily Living, Adults, Android, Apps for OT's, AT for Handwriting, Game, iADL's, iPad, iPhone, iPod, Leisure apps, Occupational Therapy, Rest and Sleep. Bookmark the permalink.